Art Resin – Different molds: Rubber/latex, plastic, silicone. As many of my friends and followers know, I am seriously addicted to resin crafting. I make jewelry, orgonite, and use it to provide a hard, shiny surface on some of my painted artwork. I wanted to try other resins as I was having a lot of problems with sticky pieces, and particularly with spider-webbing. My first attempts with Art Resin were not too successful. I mentioned this on a Facebook resin group, and Art Resin reached out to me, offering advice and encouraging me to make a second try. This time, the results were significantly better! Art Resin does have a longer curing time than the polyester resin I was using. I will still use polyester resin. I actually LIKE the smell – laugh – I know, I’m a weirdo. It’s more affordable. I like it for ease of use, for smaller pieces, especially those I glue to bezels. But overall, I like Art Resin a lot better. Art Resin, once it has cured, doesn’t suffer from “sticky back”. Or “sticky front” for that matter. 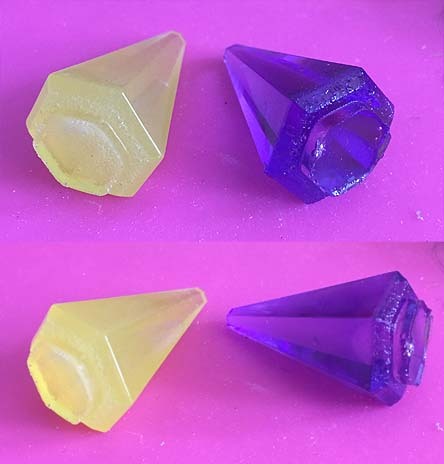 Sometimes polyester resin dries hard and solid, but the surface, especially the surface exposed to air in the drying process, remains sticky, and I have not yet found a finishing process to fully eliminate this problem. You have to be super careful to not let two pieces of finished polyester resin sit together, because they will stick together. With Art Resin, I have not yet had any problems at all with the “stickies”. 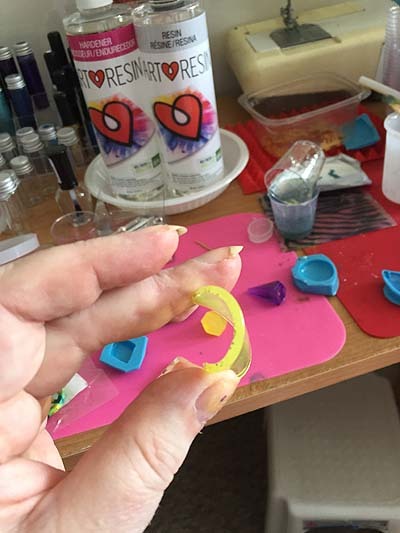 Art Resin – Compared to Polyester Resin Casting. Note the “spider webbing” around the purple polyester casting. You do have to be extremely careful to monitor heat, humidity and make sure that Art Resin is thoroughly mixed. The manufacturers instructions say to mix equal parts for at least three minutes. Resin group members tell me five minutes is better. The warmer and drier the room the better. I joked that I was going to take my castings and put them in the car in the sun, which might actually be a good idea if you are having a hard time getting a good cast. 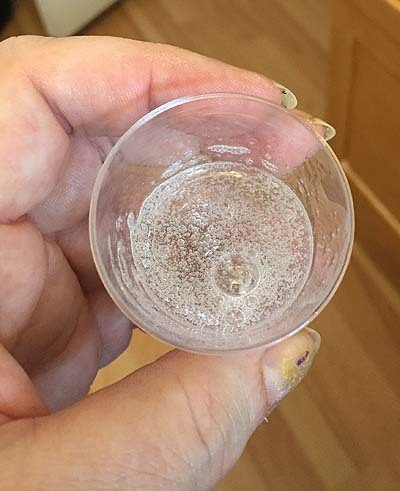 Art Resin Bubbles – blow on them through a straw, or torch after casting. Like any resin, Art Resin’s first major nemesis is the all-powerful air bubble, and it does tend to be a bit more “bubbly” than polyester. But unlike polyester, you can use a craft torch on it without setting your entire studio on fire. You do still have to be careful, as a torch can burn your molds (especially plastic or latex), but you can’t use a torch on polyester at all. Art Resin also has a longer set time, so it’s easier to poke out the larger, deeper air bubbles before things set. You also have to be a bit more careful about dust … and bugs! With the longer set time, much can go wrong. I had a fly land in a large clock and (heartbreakingly) it wasn’t salvageable. Best solution I found is an upside-down plastic bowl or box to cover things while curing takes place. I also found that I had problems getting it to set smoothly over embedded articles that were painted with nail polish. Next time, I’m going to try lacquering these articles first, and I will let you know how that goes in future updates. Art Resin can be rubbery and flexible before it fully cures, but give it time and it will harden. 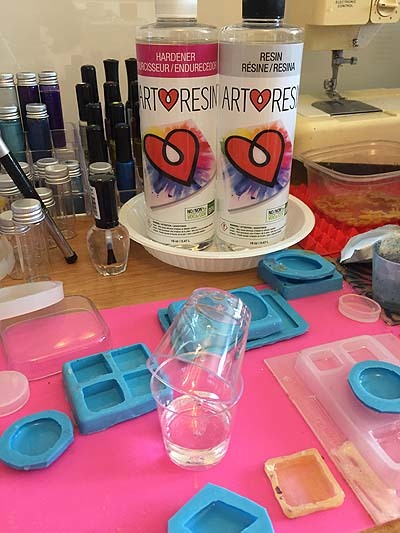 I suspect that the main problem I had with Art Resin at first was I purchased it from a small art store with a low turn over, and it was sitting among my supplies for a long time before I used it. Uncured Art Resin does have a shelf life, and you should not purchase more than you will be able to use in a year. The other problem is my own impatience! Un-molding is like Christmas for me. I can’t wait to see my creations. Leave it for a full 24 hours before un-molding. You may find it is a tad rubbery for the next 24-48 hours after that, but it will harden more as it cures over time. For coating artwork, Art Resin works superbly. It is odor-free, BPA-free, non-yellowing (I was also testing a yellow colorant in the items shown in this post), and dries super-clear. There is no guesswork about mixing, the resin and hardener are always 1:1. Art Resin is priced at a slightly higher price point than polyester resin, but its many benefits are well worth the cost. I wouldn’t even consider polyester resin for coating artwork.